The weather challenged everyone from the start, pictured here, all the way to the finish. 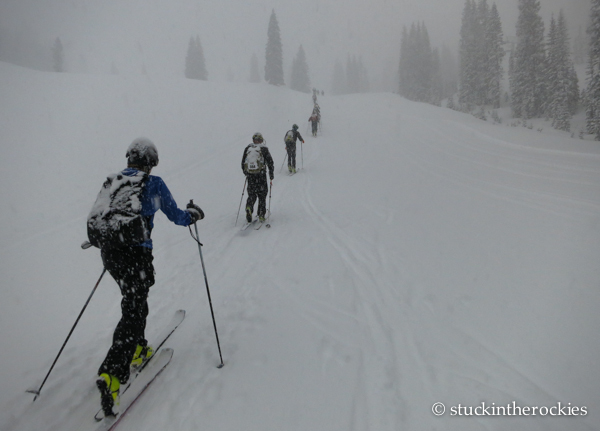 As we drove to the start of the race in Snowmass, the storm’s intensity increased. Despite the March 1st date, it was actually raining, so heavily that our windshield wipers were on high as if we were driving through a summer thunder storm. Christy and others on the way up Burnt Mountain. 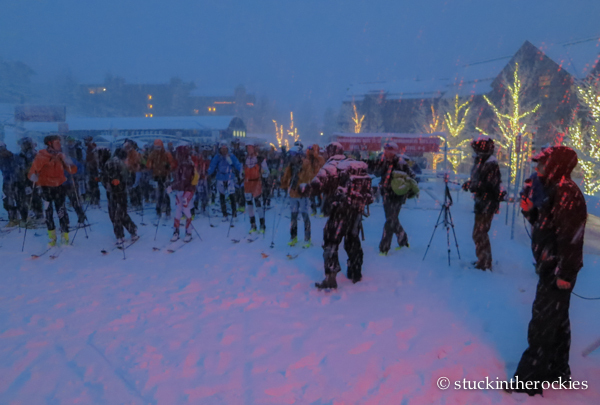 The rain was falling as snow higher on the mountain and the 6am race start was delayed to allow for more time to get the Highland Bowl avalanche control work completed. Rumors quickly spread that the Bowl might not open and the course would be re-routed. At 6:30 a.m., about 100 teams of two began the race along the 26-mile course that gains 12,000 vertical feet. As we made our way up Burnt Mountain, the snow fell heavily. At the top, our gloves, shirts, and shells were soaked, the new snow was deep and getting deeper, and the winds picked up. On the ski from Burnt Mountain to Buttermilk. The snow had let up for the moment. 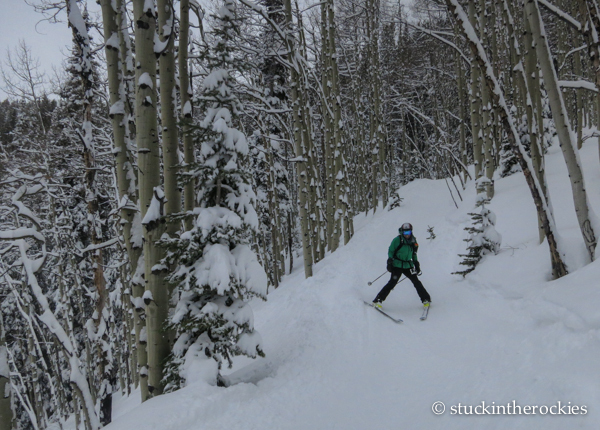 Skinning up to Buttermilk with Bob and Maile. We all marched on…. 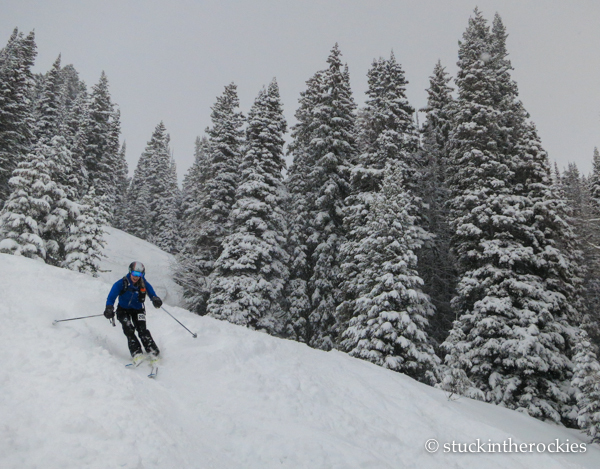 We skied across the ridge to the top of Buttermilk and down Tiehack through 10 inches of wet powder. The asphalt bike path that we normally walk over to Highlands was snow-covered and could be skated. The 4,400 vertical foot climb up Highlands was the usual grunt. By the time we approached the base of the Highland Bowl climb, enormous wind gusts forced Christy and I to layer-up with everything we had— shells, mitts, buffs, and goggles. 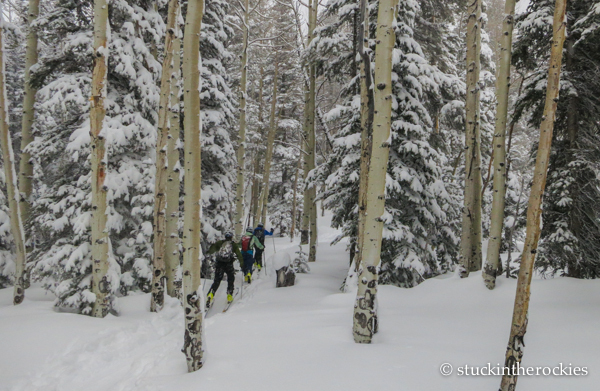 We were told an alternate route down Mushroom was available if we didn’t want to battle the weather up to the Peak. We saw some racers opt for Mushroom, and others who decided it was all too much to bear were heading down the frontside to call it a day. Lucas Franze and Charlie MacArthur on the climb up the Bowl. Christy, doing her best not to get blown down into the Castle Creek Valley. But when I asked Christy what she thought we should do, she rather expectedly replied “Head on up.” Of course. Why did I even ask? It was as bad as the worst day we could remember. Unrelenting gusts forced people to take a knee, or risk getting blown over, and exposed skin quickly turned white. Eventually we were at the summit. 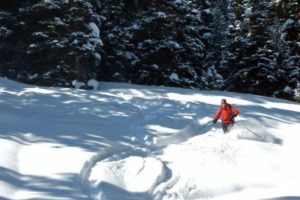 By the time we skied down Full Curl, there was nearly two feet of untracked snow all the way down to the Deep Temerity chair. 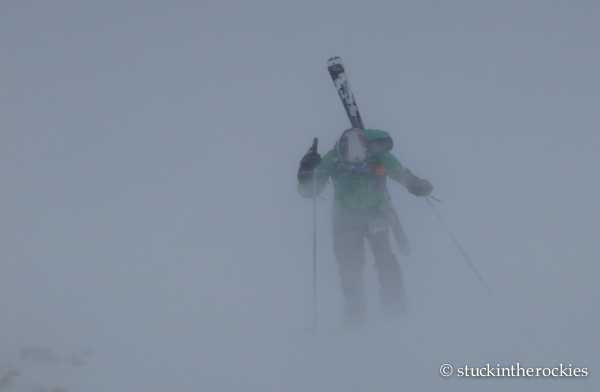 Skiing off the top and out of the wind– the worst was now behind us. Tired on the Congo Trail. With that behind us, the rest of the day seemed easy. Relatively speaking at least. The Congo Trail was in great shape and Midnight was the typical slog, but it was out of the wind. By the time we reached the Sundeck, it was dumping snow again. But it didn’t matter, it was the homestretch and we were just happy to cruise down the moguls of Walsh’s and Bingo Glades to the finish of this crazy day. 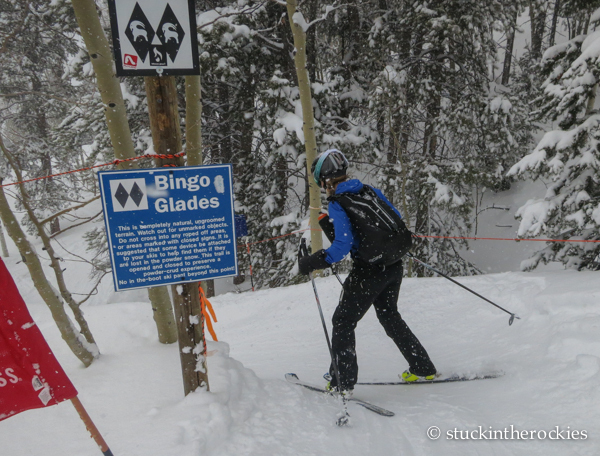 Dropping into Bingo Glades. 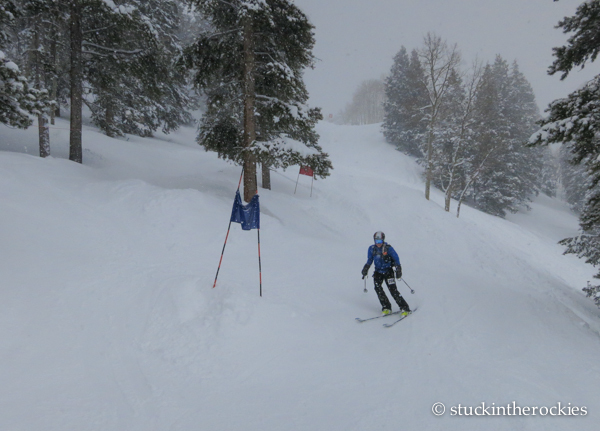 This course doesn’t cut racers much slack. It’s a tough finish run. 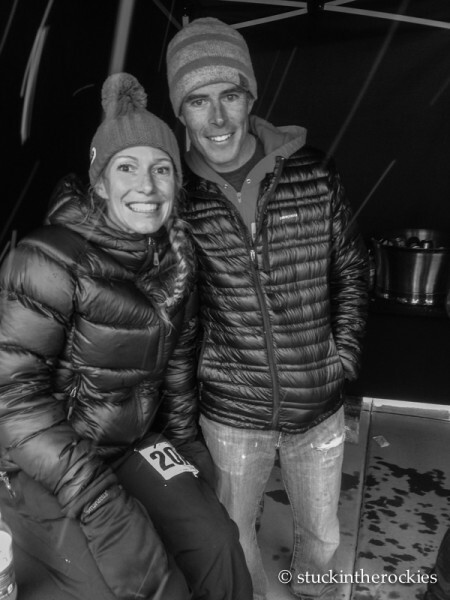 Between soaked gear and clothing, heavy snow squalls, and wind up on Highlands Bowl, it was definitely the most challenging conditions this race has seen. Eventually the Highlands Patrol had to close the Bowl all together. 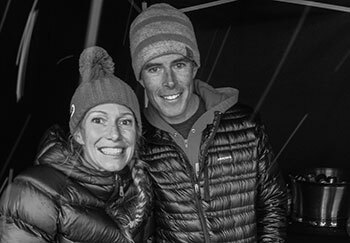 The stories of suffering and punishment, DNF’s, and all around slow finish times were shared all night at dinner and the awards. Down in Bingo Slot– we’re done! 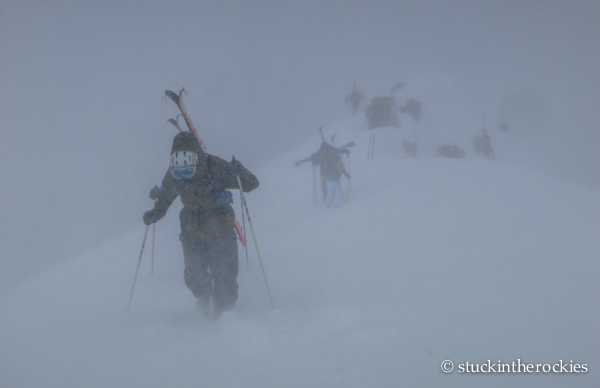 Hats off to everyone who was out there and pressed on through the adverse conditions. 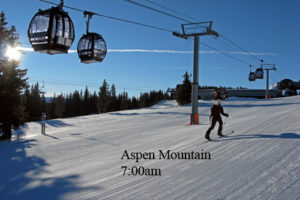 And thank you to the Aspen Ski Company and ski patrollers that did everything they could to keep this day moving forward. It wasn’t easy. I’m pretty sure that people will use this year’s race as a measuring stick to which to compare all others. Really impressive to finish the full course under those conditions. Well done! 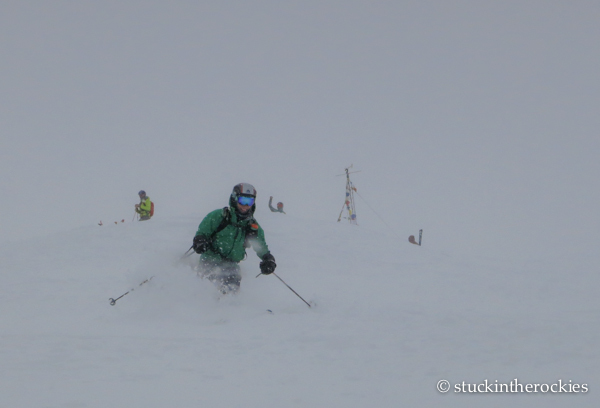 I happened to ski Ajax that day (I passed on Highlands due to expected low visibility), and feeling the strong winds at the top and the heavy snow, you had to feel sympathy towards anyone out there racing. And then I saw all the tracks going into Bingo Glades — a last-minute kick in the stomach — or legs — indeed. Snow was great though! All-day refresh. Congrats! That should have been great traing for the GT. Saw a comment here about Potosi. A few of us climbed Teakettle in Sept a couple of years ago and are planning to do Potosi much earlier so we can take advantage of the snow couloirs instead of the unlovely talus. We’d appreciate any beta. Congratulations Team Mahon! And thanks Ted for taking the time to photo document the brutality of it all. Pierre had zero photos to share. 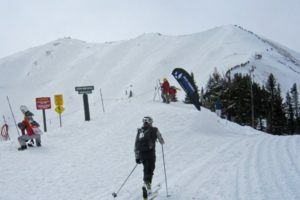 I already told Christy that day was one of the best of the year on Aspen Mt., probably because everyone of note was either racing or volunteering somewhere in our Four Mountain Complex. It wasn’t all pleasure though; I suffered mild vertigo in Spar…..
Scott, I heard that quote several times on the way up Burnt Mountain when it was really dumping. Funny. 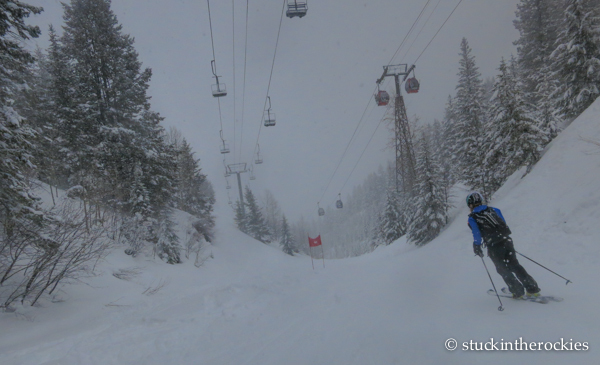 I’d be lying if I didn’t think it was more fun in conditions like we had. Arlene- check out the new backcountry skiing guidebook on Potosi. I put up a blog about it a few weeks back. I think the info on skiing it would be pretty helpful for snow climbing as well. See you in a few weeks. Well done in that race, Ted & Christy. Harsh conditions, but if anyone can persevere, its you guys. The mountaineers in you guys sure come in handy when conditions and weather turn to total crap. Nice work!